In my first competition of this outdoor season, the Bobcat Classic, I placed 8th in the 1500m race and ran a time of 3:59.36. As mentioned in the last article, the training in the last months did not work out as expected. In the last four weeks I was able to increase my amount of running and because of that I will run in the last few weeks of this years outdoor seasons two races. The first race took place in San Marcos, TX. 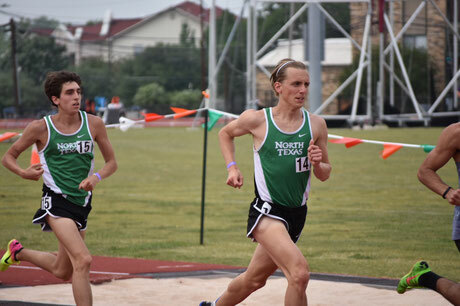 This 1500m race was the last opportunity to race before the Conference USA Championships. Since I just started working out on the track two weeks ago, my goal was conservative. After pain free running during the last weeks, during the warm up there was another setback. I did a wrong step and had the next minutes a bad feeling in my right foot. Because of that my trainer decided to stabilize my foot to prevent another wrong step. This decreased my flexibility but at least I was pain free. In the first attempt to start the race, one of my competitors fell and we had to start again. In the second start, I settled into the back part of the field and tried to run as smooth as possible. I stayed in this position for the first 800m and started to catch some of the guys. Finally, I finished the race in 8th position with a time of 3:59.36. Compared to the last few years, this time is definitely not where I want to be. It is around four years ago since I ran slower than this time but through the difficulties in the last months I have to accept that result. In the end, I was really happy to run outdoors and enjoyed to compete again. Now, I have two more weeks until the Conference USA Championships where I can help the team by running the 5000m.